Drive 48 kilometers south of Beirut along the coast to Sidon, the third great Phoenician city-state which experienced its golden age during the Persian era between end of the 6th century BC and mid of 4th century BC. Sidon; ancient Sidouna, one of the famous names in ancient history, was an open city with many cultural influences, including the Egyptian Pharaohs and the Greeks. During the Persian period, Aegean sculptors contributed to the nearby temple of Eshmoun; the city's god, which was associated with the Aesculapius, the Greek god of healing. The Crusader period (1110-1291 AD) brought Sidon new prestige, as second of four baronies of the Kingdom of Jerusalem. Today you can enjoy visiting the ruins of the fortress church known as the Castle of the Sea which was erected by the Crusading Knights of St. John, and the Shell of the Castle of St. Louis (the Land Castle) which sits atop the Phoenician Acropolis near Murex hill, so named after the Murex shell from which the famous Phoenician purple dye extracted. In the old town, more recent Mamluk and Ottoman buildings worth a visit such as Soap Caravansary (Khan Assabun), Franks Caravansary (Khan El-Franj) built by Emir Fakhreddin II, and the Great Mosque above Egyptian Pharaohs harbor which still retains the 13th century BC walls of the Castle of the Sea. Phoenician Sour (Tyre) was queen of the seas, an island city of unprecedented splendor. She grew wealthy from her far-reaching colonies and her industries of purple-dyed textiles. But she also attracted the attention of jealous conquerors, among them the Babylonian King Nebuchadnezzar and Alexander the Great. 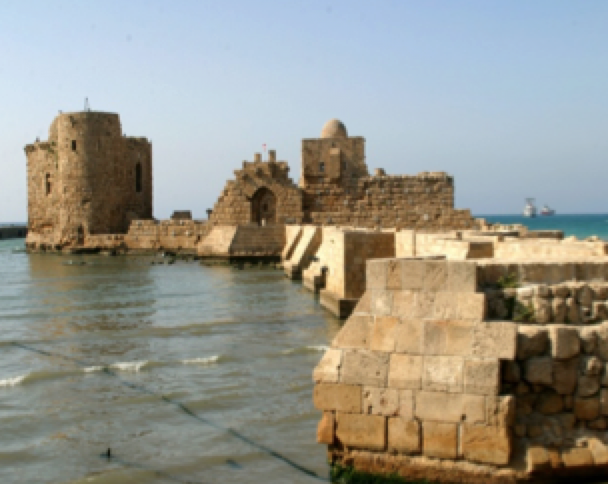 Tyre originally consisted of a mainland settlement and a modest island city that lay a short distance offshore. In the 10th century BC, King of Tyre, Ahiram, joined two islets by landfill. Later he extended the city further by reclaiming a considerable area from the sea and built two ports and a temple to Melkart, the city's god. Phoenician expansion began about 815 BC when traders from Tyre founded Carthage in North Africa. Recent excavations have uncovered Crusader, Arab, Byzantine and Greco-Roman remains, but the city that has come to light is the Roman and Byzantine settlement. The loveliest relic is a reconstructed Triumphal Arch. A Necropolis situated on both sides of a long avenue is most impressive, and the Great Hippodrome for chariot racing is remarkable in that it was built of stone while most others were built of brick.